Chili’s Skillet Queso Dip Copycat Recipe: A Perfect Mash Up Of Others. We love Chili’s Skillet Queso and Chips on Chili’s Appetizer Menu. And now I can make it perfectly at home. Well, we think so — That’s six of us here who have tried it several times. 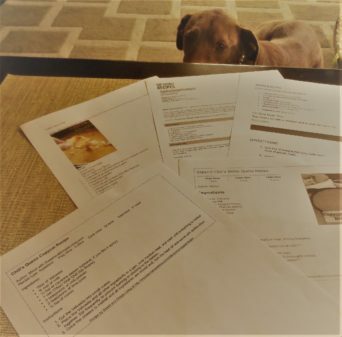 I searched the internet for a good copycat recipe and found five. Enlarge photo above to view them. 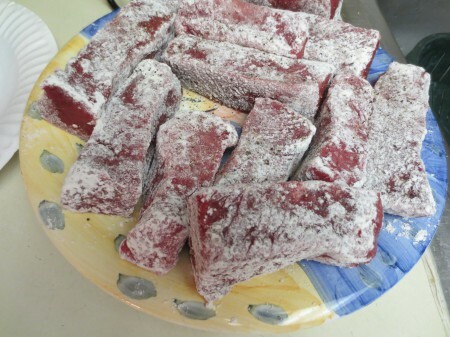 I took all into consideration to subsequently create my own, slightly different than the other’s variations, based on what I know about its actual flavor and texture. My Chili’s Skillet Queso copycat recipe is posted below. For the Dip only. Chili’s Chips are too good to copy. To make Chili’s ‘Skillet’ Queso Dip as easy as possible, I combine all ingredients in a small crock pot and occasionally stir — Technically this recipe should be called… Shelly’s Crock Pot Queso Wannabe Chili’s Skillet Queso, which is a long, dumb sounding name, but that’s what it is and how it tastes. 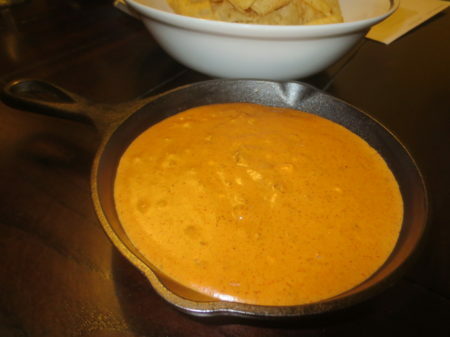 However, for the authentic Chili’s Skillet Queso and Chips experience, I serve the Queso in the small skillet below and pick-up Chili’s Chips to go, since I cannot re-create their thin, delicately crispy texture. I’ve previously posted about Chili’s amazing Chips and Skillet Queso Dip here. 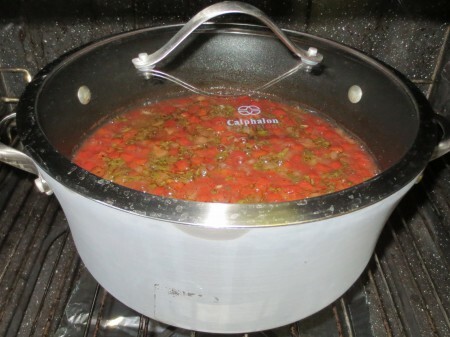 Combine all ingredients in a small crock pot and stir occasionally until evenly melted. Serve the Queso Dip from the crock pot or transfer to a small skillet or bowl. 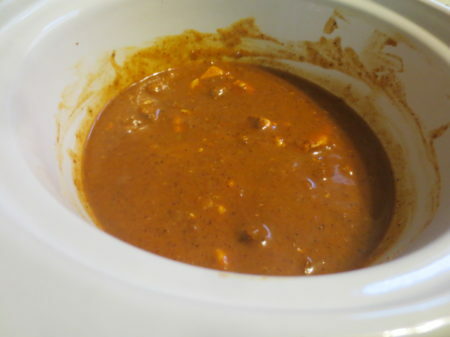 If you don’t have a small crock pot, combine all ingredients in a small sauce pan and cook on low stirring occasionally. FYI: After this process, I now realize that Chili’s Skillet Queso is most likely not prepared in the small skillet it’s served in, ha — Chili’s may need to clarify ‘Skillet’ too. Dirty Sauce: It’s Ike’s Love & Sandwiches Very Special Ingredient. It’s the Dirty Sauce that makes Ike’s Love & Sandwiches so darn great (and the Dutch Crunch Bread). Ike’s Dirty Sauce is on every Sandwich, unless specified otherwise. This time I ordered it on the side to decipher its ingredients. It’s one of the things I like to do. Breakdown a recipe. And from what I can taste, see and smell, it appears to possibly be made with Mayonnaise, Butter, Garlic, Cayenne Pepper, a few fresh and/or dried Herbs, Salt and maybe other Spices — Not the precise breakdown I hoped for. It’s more complex than I thought it would be, though I should have known that by its elevated flavor. That’s why it’s so good and why it’s on most Sandwiches. Boom. Dirty Sauce — It sounds weird, but don’t be afraid of its name. Get it on your Sandwich. Pickles Loves Pickled Grapes: Favorite Blue Apron Repeat Recipe. 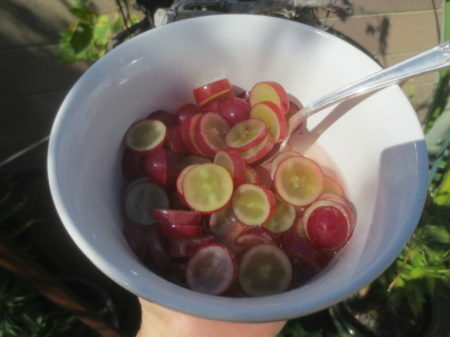 Have you ever tried Pickled Grapes? I hadn’t until last year and will now eat them forever. I buy Grapes more often because of it. 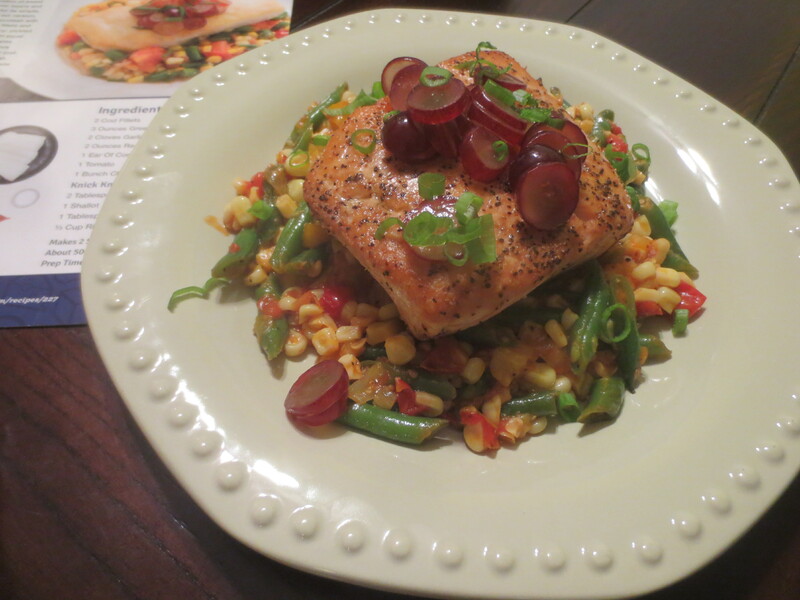 Pickled Grapes are amazing, especially when served with Fish over a Summer Succotash, pictured below — It’s our favorite Blue Apron meal that I’ve made several times. The original recipe used Cod, which is fine, but I’ve since used Salmon and Yellowtail at different times. This dish is extremely flavorful with much attributed to the Pickled Grapes. A little White Wine Vinegar (2 T.), Sugar (1 T.), and a big pinch of Salt do a lot to elevate Grapes (at least 2 oz. 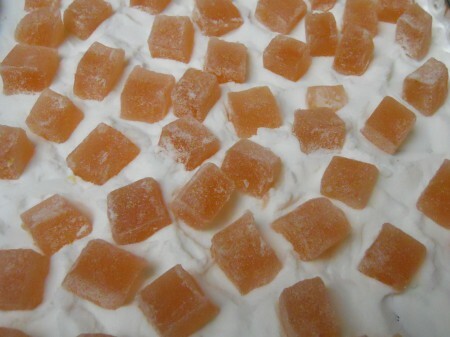 ), to a refreshing gourmet topping, side or special ingredient in another dish. Simply combine cut Grapes with all ingredients, let marinate for at least 10 minutes and see what we’re saying. Yum! Pickling is a beautiful thing, I’ve discovered. And my husband happens to call me Pickles. It’s just meant to be. Consult Blue Apron for more about recipe #227. We love it too. Menu Change Update: Get The Caramelized Brussels Sprouts I’m Told. It’s happened again, a favorite dish is taken off the menu. For some reason I tend to favor dishes that don’t sell as well as others. This time it’s not much longer after reporting about it that it’s gone. It was Simmzy’s Cauliflower with Cilantro Pesto, linked here. After sitting down with a Beer Flight at Simmzy’s Long Beach location, we learned it’s no longer on their menu. What? Maybe they will bring it back. Until that fine day, we tried Simmzy’s Caramelized Brussels Sprouts (pictured), a suggested popular dish. It’s good, but it’s not their super-tasty Cauliflower with Cilantro Pesto that is now on my copycat list. I must try to recreate what I can no longer point to and have. Aside from these dishes, Simmzy’s menu offers much I’d like to try. 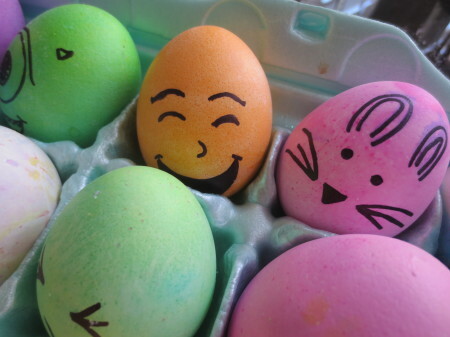 Happy Easter From Kids In The Kitchen At Nibbles Of Tidbits. 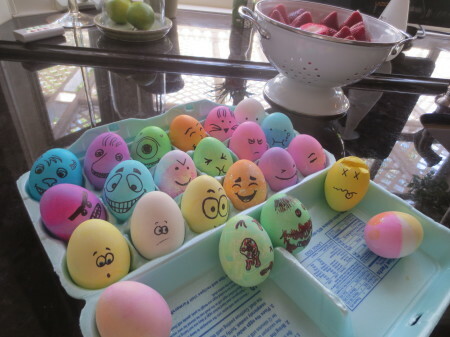 Funny Easter Egg ideas by Bailee and Lexi, also known as Kids in the Kitchen here on Nibbles of Tidbits, and my talented Nieces in real life — They decorated each adorable Easter Egg pictured here. 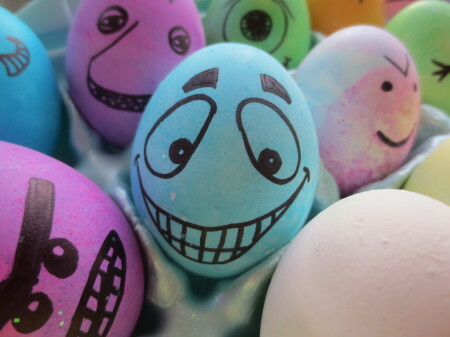 I’m impressed — They’re all so expressive and made us laugh. 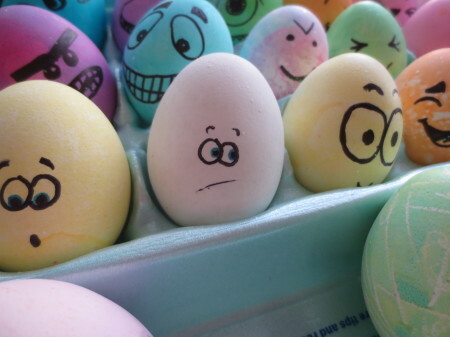 If I copy them mine probably won’t turn out as great, but next year I want to try. The green zombie eggs in the lid of the carton show their support for The Walking Dead, yikes. 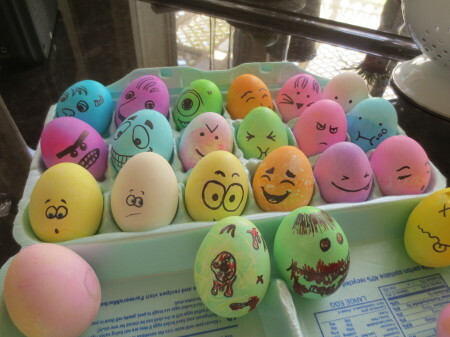 Happy Easter to everyone from Nibbles of Tidbits — We’re thankful for this day! The kid’s inspiration and my copycat comparison shall be posted next year. Best Dessert In Fullerton: Sticky Toffee Pudding At The Olde Ship. 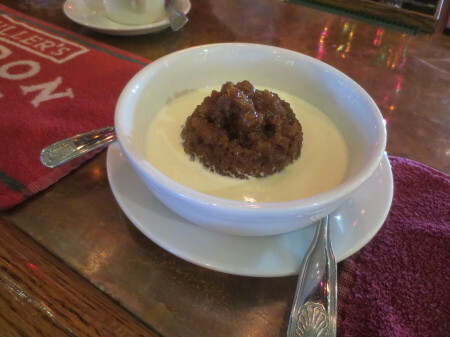 Have you had the Sticky Toffee Pudding at The Olde Ship British Pub & Restaurant? 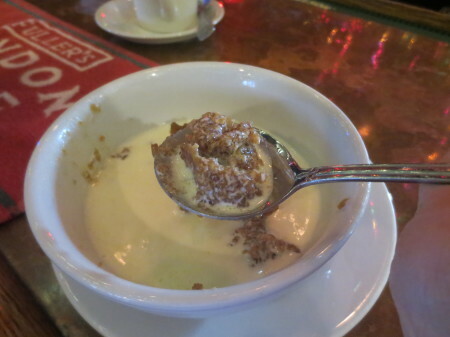 It’s one of the BEST Desserts I’ve had in my life and it’s perfectly served in warm Heavy Cream. I’ve had it three times and still can’t stop thinking about going back for it again. 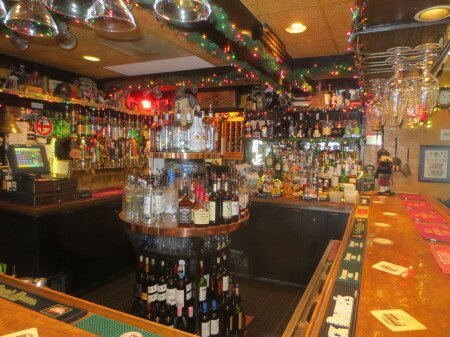 I suggest going to The Olde Ship each time we’ve dined out recently, but my husband needs more food variety. It’s a rich dessert that’s best shared, so not to be put over the Sugar edge. The unsweetened Heavy Cream balances the sweetness beautifully. I love The Olde Ship for this dessert, other authentic British dishes and its cozy atmosphere, especially during Christmas time. 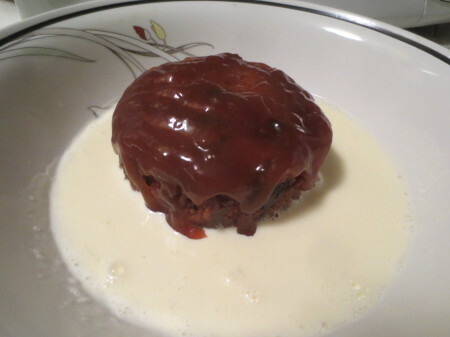 I searched for The Olde Ship’s Sticky Toffee Pudding recipe online, but didn’t find it, I’m told it’s made with Dried Apricots and other things. I may attempt a copycat recipe after a little more study. I visited The British Grocer, a store run by the same people at The Olde Ship in Fullerton and Santa Ana. The British Grocer is in Fullerton, down the street from The Olde Ship British Pub & Restaurant on North Harbor Boulevard. 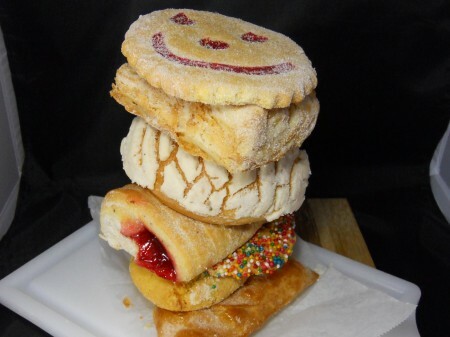 I’ve yet to visit its Santa Ana location, but hear it’s larger. Pictured directly above is a prepared, canned Sticky Toffee Pudding I purchased from The British Grocer. I was told by a clerk there that’s its flavor is most like the one made at The Olde Ship. The store offered two options, one that’s frozen and this one that was canned. 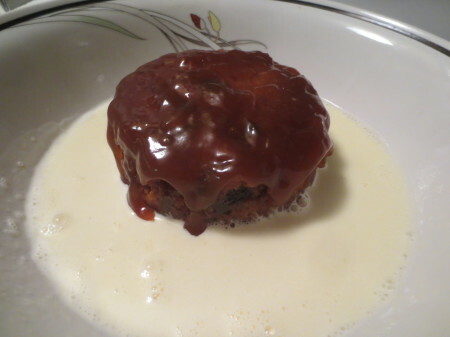 Surprisingly this one is made by Heinz and it does have a similar, rich flavor that’s good served with warm Heavy Cream, though it has a different, more Bread Pudding like texture, rather than a loose, Bran Muffin texture like the Sticky Toffee Pudding prepared at The Olde Ship. I’ll buy more of both. 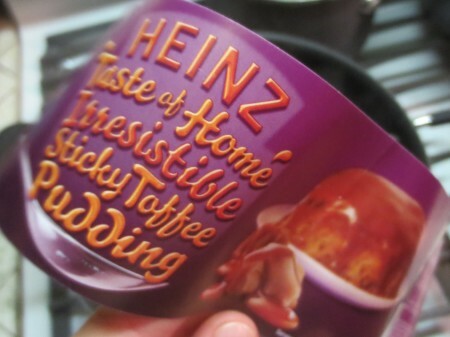 I served the Heinz Sticky Toffee Pudding the same way, which made it taste great. 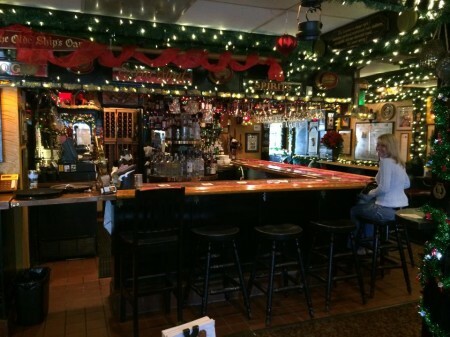 It’s romantic and beautiful inside the Pub, with hundreds of lights in December. 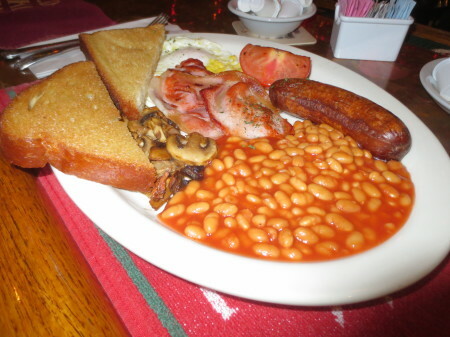 Pictured below is the Great British Breakfast that’s served with a Banger, Baked Beans, Irish Bacon, a Tomato, Mushrooms and Fried Toast. At first glance, the Toast looks basic, but it’s fried. I thought I’d like that more than I did, but toasted is better. I like the Baked Beans a lot. 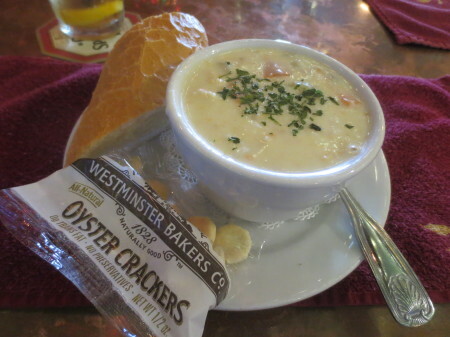 The Olde Ship’s Famous Clam Chowder is very good too, with lots of Clams. 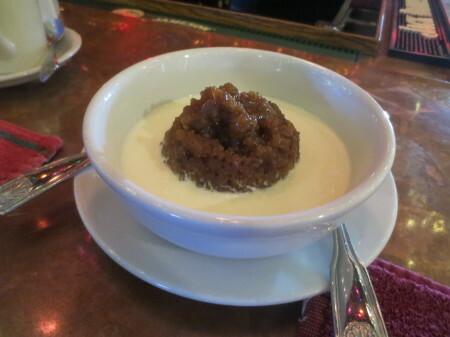 Back to why this post started… The magnificent Sticky Toffee Pudding at The Old Ship (below). 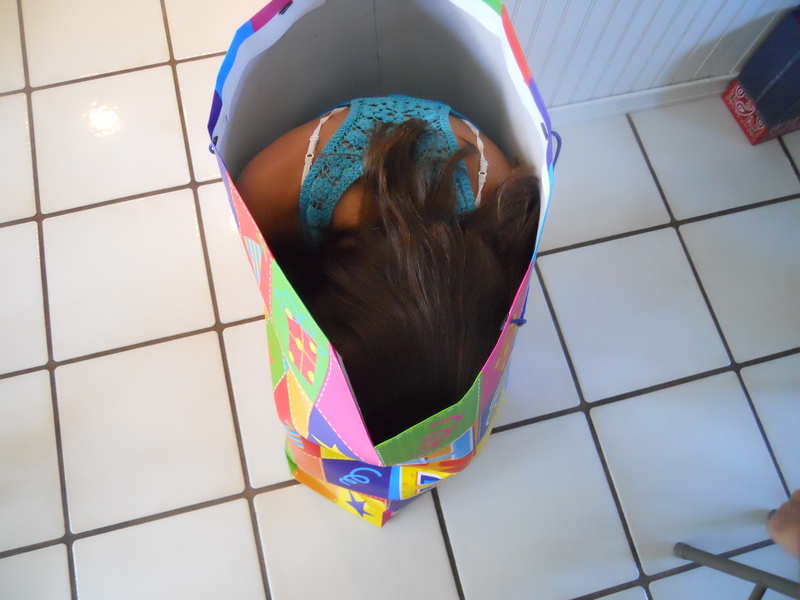 Until we meet again, aka when my husband is ready to go back — I have to be reasonable. Two Ingredient Pizza Dough: Self Rising Flour & Plain Greek Yogurt. 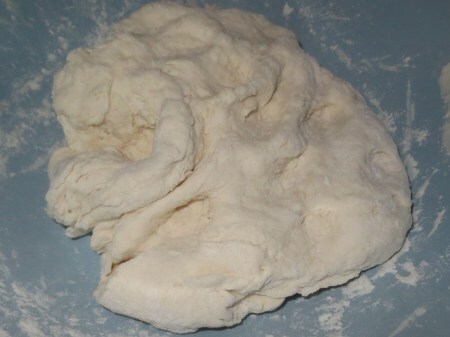 Did you know that you can make a Pizza Dough using only two ingredients? You can. 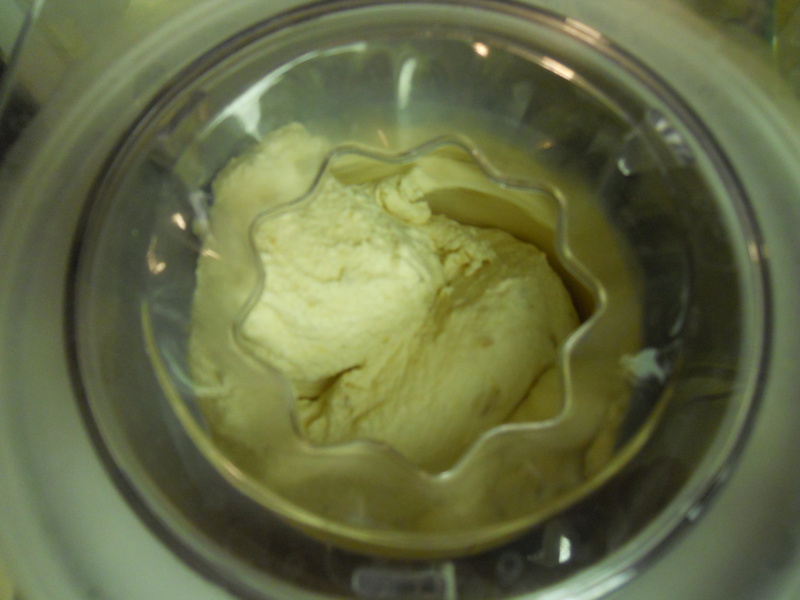 Two Ingredient Pizza Dough is made with Self Rising Flour and Plain Greek Yogurt. I heard about it and had to try it. 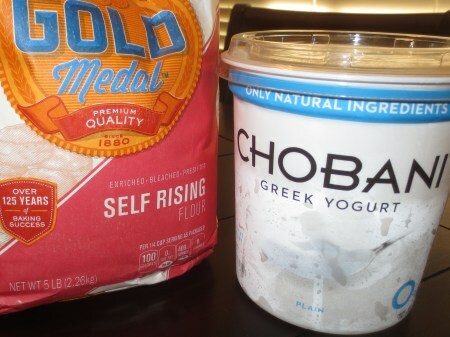 And it’s true, it works with (1 ½ Cups of Self Rising Flour & 1 Cup of Plain Greek Yogurt). I simply combined the two, then kneaded both into Dough. It didn’t take much time or effort to convert into a blank Pizza canvas. 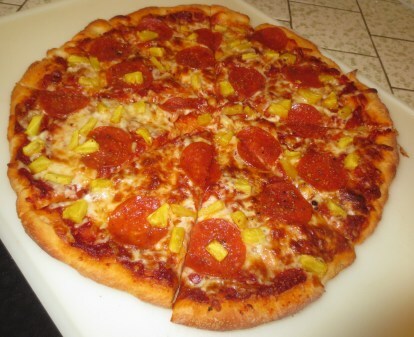 I made a basic Pepperoni & Pineapple Pizza, with a Pineapple homegrown by my husband, I might add. 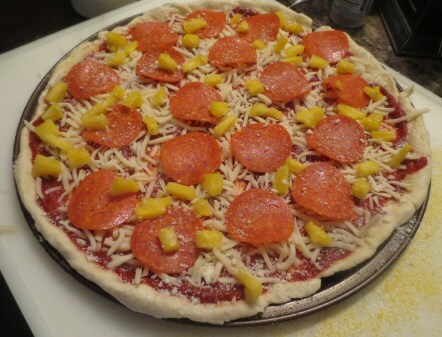 I also added Pizza Sauce, Parmesan and Mozzarella Cheese — Other Recipes. The Pizza was baked in a preheated 450° oven for 12 minutes and all turned out well, though the flavor of the Pizza Crust is a little bland and would taste better as a Three Ingredient Pizza Dough with the addition of a little Salt — That’s what I’ll make next time. 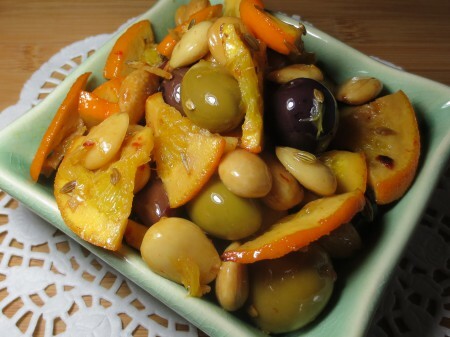 A Little Something: Olives, Almonds, Oranges, Fennel & Pepper Flakes. 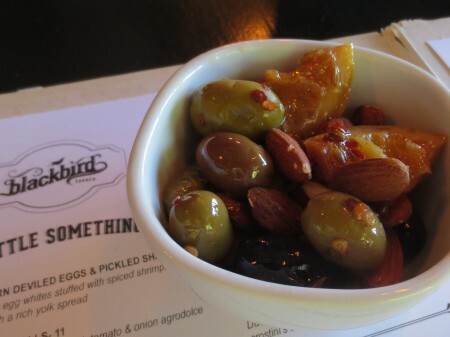 It’s “A Little Something” called Almonds & Olives at Blackbird Tavern in Temecula (below). I liked it so much, I recreated a better version of it at home (top photo) — It’s made with a medley of Greek Olives, Marcona Almonds, Orange Slices, Fennel Seeds, Red Pepper Flakes and Olive Oil. The Olives were baked in a foil pouch with the Orange Slices, Fennel Seeds, Red Pepper Flakes and a little Olive Oil at 425° for about 15 minutes, then all was tossed with Marcona Almonds, the improvement (I think) to Blackbird’s starter. I’ll make it forever. And there’s a sweet back-story soon to be told about this trip to Temecula. 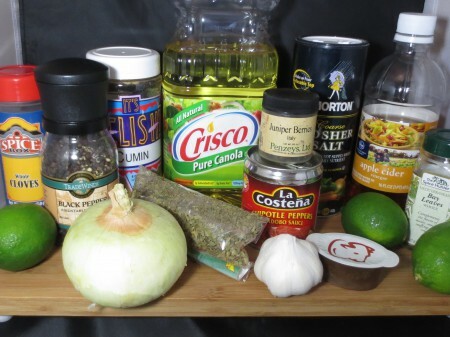 Everything But The Beef For Chipotle’s Barbacoa Beef (Copycat) Recipe. I’m still excited about Nibbles of Tidbits’ version of Chipotle’s Barbacoa Beef Recipe — It’s one of our most popular posts and rightly so. Many think it tastes like the real thing and so do we. Since it was recently made again, the ingredients were photographed and added to the original post (and here to announce it) to assist with shopping and preparation. Enjoy. 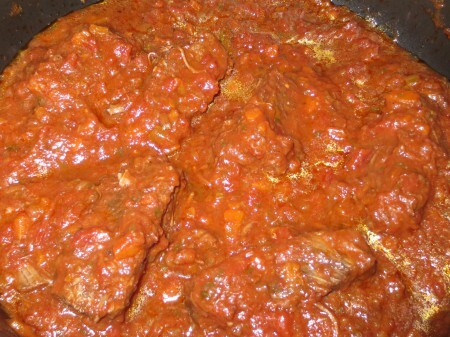 Carrabba’s Beef Brasato Recipe: Taste It Without Being There. Linked here is a video of a Carrabba’s Chef making their Beef Brasato, which is featured in one of Carrabba’s Italian Grill’s commercials. Though I’ve never been there, the dish Beef Brasato looks and sounds pretty good — It’s basically slow braised Short Ribs, Italian style. 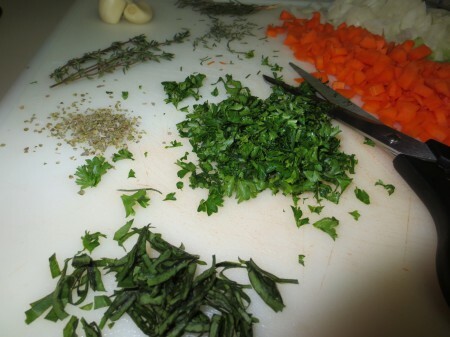 Carrabba’s Beef Brasato RECIPE has the makings for a great dish… Wine, Beef, Fresh Herbs, Garlic, Onion, etc. All ingredients are pictured but not listed — If visually indecipherable (Olive Oil, Dried Sweet Marjoram, Crushed Tomatoes, Lemon Zest), the complete list is here. 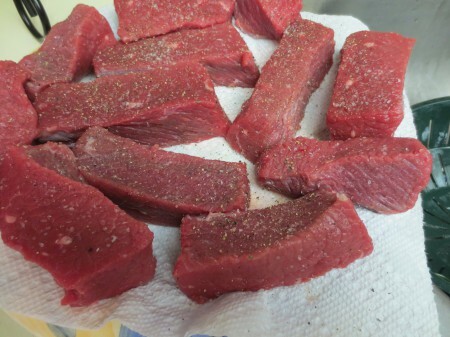 Carrabba’s Beef Brasato recipe is (somewhat) summarized here in a few photos. 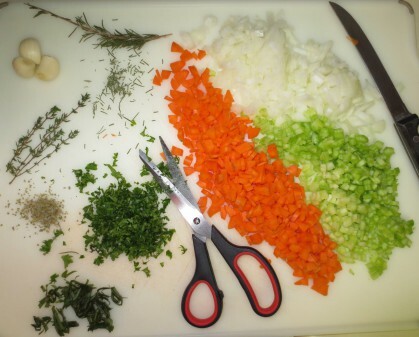 Cut, dice, chop, crush and press the Garlic, Herbs and Vegetables. Flour, Salt, Pepper and sear the Beef Short Ribs. 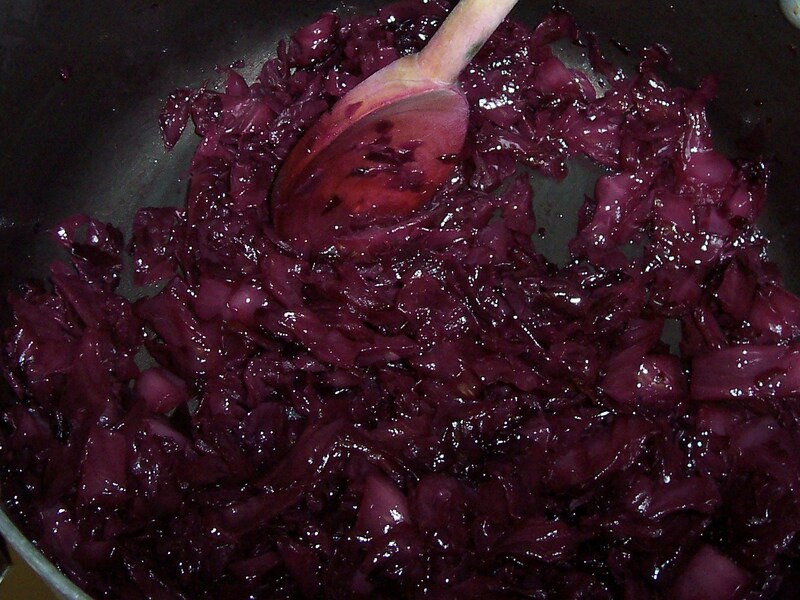 Add Garlic, Red Wine, and return the seared Beef and add the remaining ingredients. Apologies for the poorly seared Beef, pan wasn’t hot enough (a common story on The Bad). 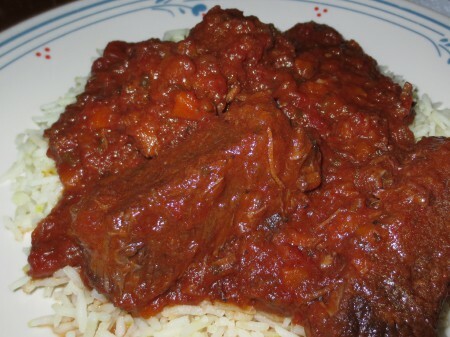 Braise all covered together in the oven at 300° – 325° for 4 hours, until Beef will fall apart. 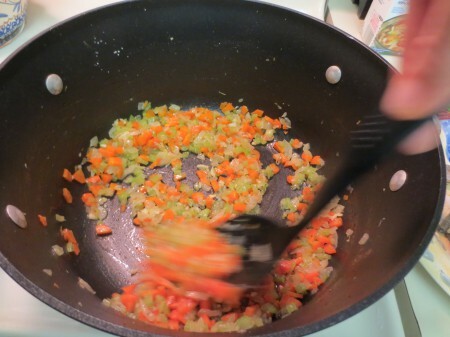 Serve over Rice or Risotto — It was flavorful, though I added too much Crushed Tomato. I’d make it again or try it at the restaurant someday — The pics don’t validate it well. Healthier Copycat Gone Wild: The Bad Before The Good. Fodder for The Bad, though ultimately not too bad to not eat it — The story ends well with a fast and easy, homemade Tomato Soup. And our Grilled Cheese Sandwich wannabe ended up okay, obviously with less Cheese. Inspiration to prepare both came from Panera Bread, where I recently enjoyed another version of this Sandwich (and Soup). My Tomato Soup is healthier and tastes just as good, if not better. Full story and recipe to be posted here soon. 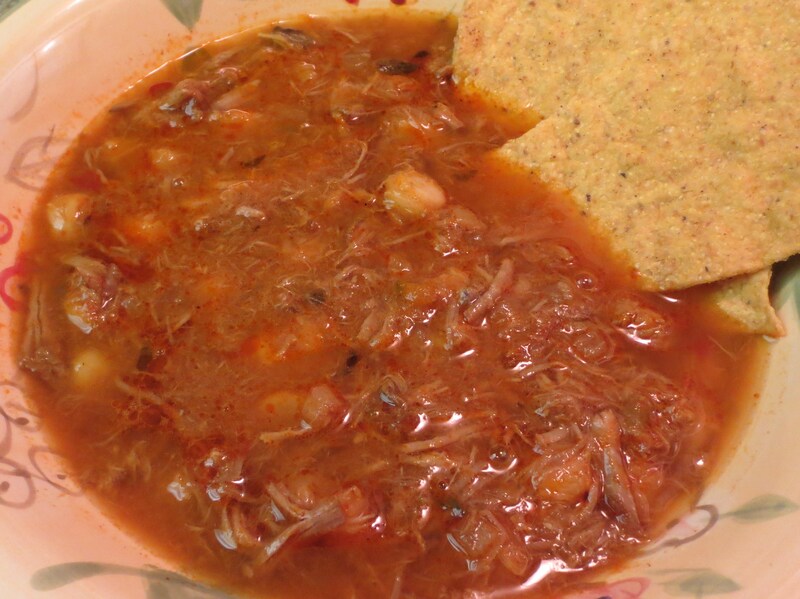 Pozole Check-A-Roo: Reconstituted Dried Chiles That’s The Ticket. 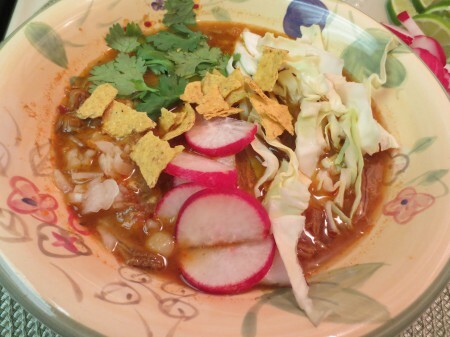 Dare to make Pozole — Check, and in most cases it’s all about the reconstituted Dried Chiles. In researching how to make Pozole, I learned… Dried Chiles soaked in Hot Water, then puréed and added to the Broth commonly denote this Mexican Soup, as do its accompaniments. 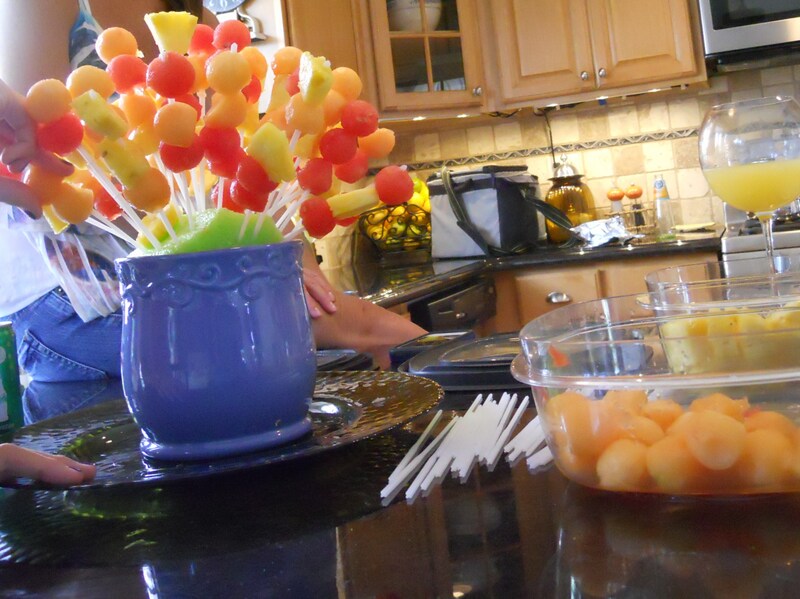 Its familiar garnishes include all shown and more. 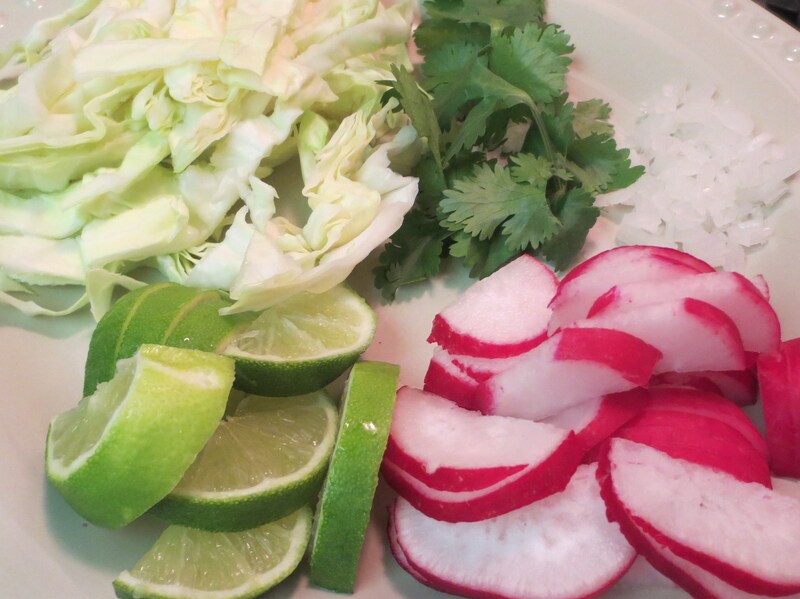 My first attempt at making Pozole turned out fairly well, but not great enough to add a recipe. I referred to several recipes in order to make the pictured version and will add more Chiles next time — Extra RED to be best fed. 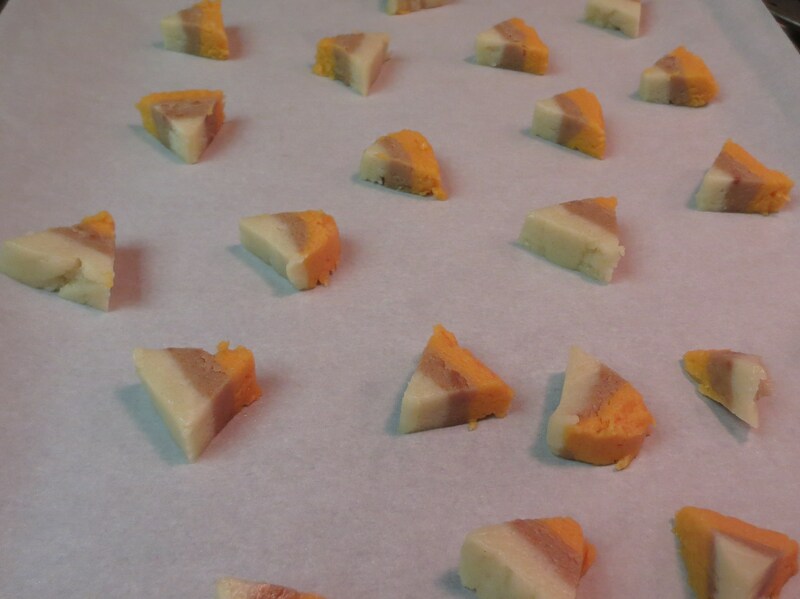 Candy Corn Cookie Wannabes: Cookie Dough Type Is Important. They were easy to make, but it seems the Sugar Cookie Dough I used (Pillsbury) isn’t conducive to the recipe shown below and linked here — The Candy Corn Cookies baked up well-formed on the video, but my wannabes didn’t end up as triangularly cute or colorful. 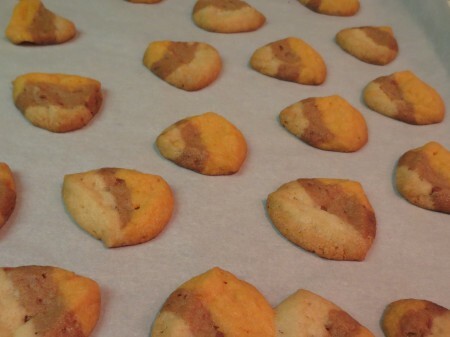 The pictured Cookies didn’t stay triangular and basically baked into blobs. 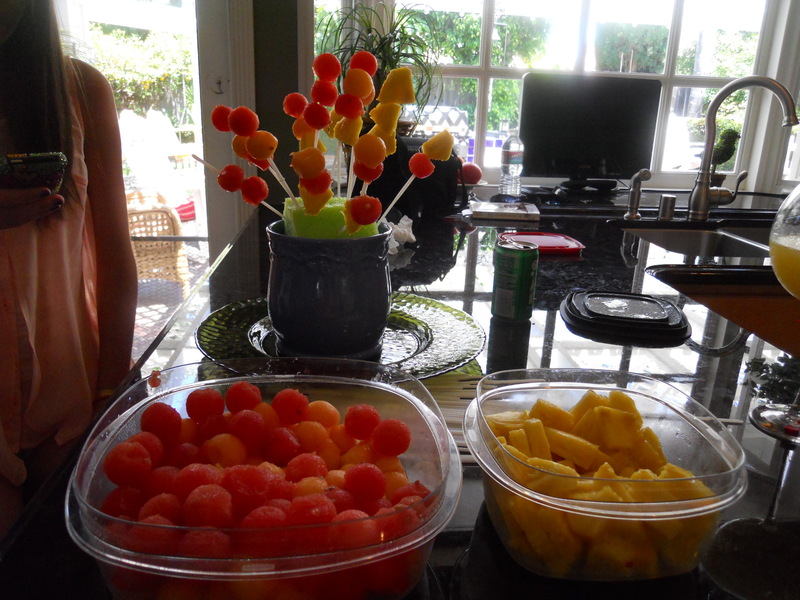 The wannabes were entertaining to make and not bad to eat, but not what I wanted. Extra Extra: Recycled Edible Arrangement Stems Grow New Fruit. 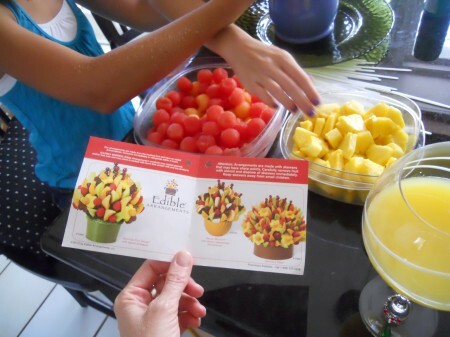 Have you seen, tried or received an Edible Arrangement? They’re sure nice, but not cheap. If you’re delivered one, save its bare bones — My Mom did and prepared them to live again. 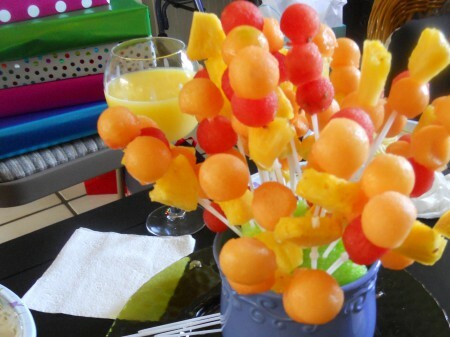 The frame of an Edible Arrangement is basically a pot with a foam insert and plastic skewers. 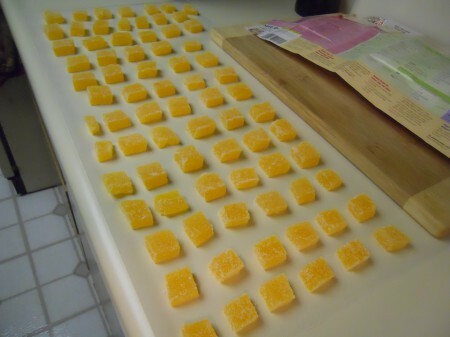 Just cut and ADD FRUIT for an anytime array. See here for ideas, buy one for its eventual bones or assemble a kit with craft store materials. Chef Bailee and Lexi of Kids in the Kitchen created a fruit bouquet for a family birthday party, but didn’t want to be seen on camera this day due to teenage makeup concerns — Well, okaaaay then. 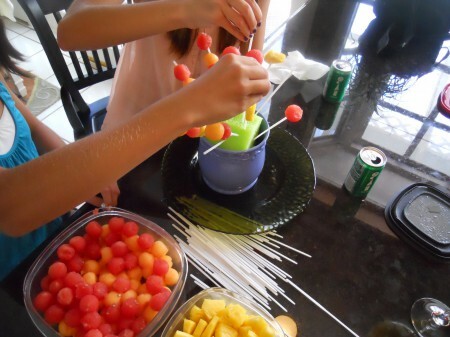 They enjoyed crafting it, an outcome sought most. And it’s tasty too! 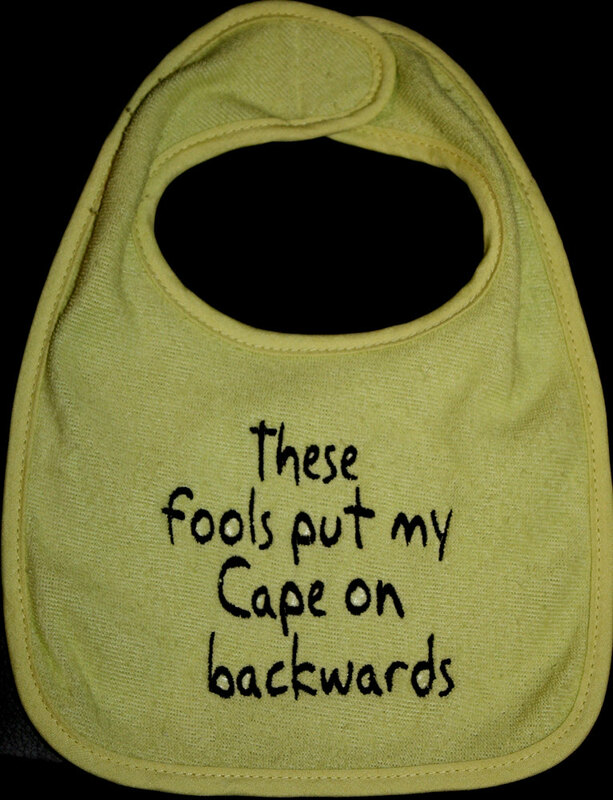 Showering Babies On Cinco De Mayo: Cadillac Milk On The Rocks? 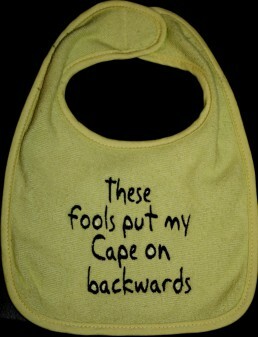 A bib for the baby? 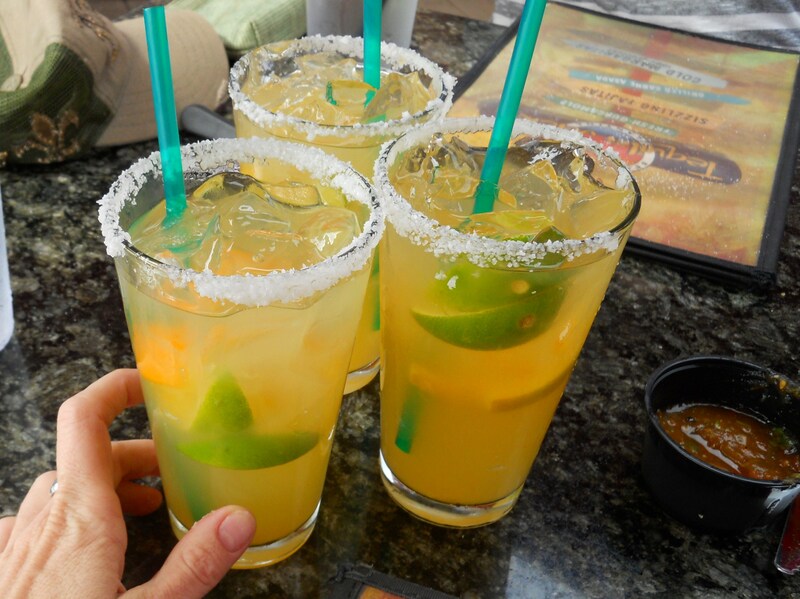 Here you go — Happy Cinco De Mayo! It’s now on to La Espiga De Oro. And we might want a big, fat, wet Burrito don’t you know. Or we’ll make Nibbles of Tidbits’ Chipotle Barbacoa Beef Copycat Recipe?! Or opt for Chinese take-out to avoid crowds and labor — TBD after the Cadillac. Much to possibly do — Salud to a new Superman too! Milk is good food. Green Bean Fries Or Green Bean Bakes: Let’s Call The Whole Thing Off. I made a variation of these Baked Green Bean Fries — They question whether or not they can be called “Fries” since they’re not fried. What do you think? Are Fries determined by shape or cooking method? I understand the debate, but can’t take a side. We say both. We dipped them in Ranch Dressing, just like French Fries, but call ’em Stix if you insist. Either way, I likely won’t be making them again, as they’re just okay for the effort. Heather’s RECIPE is HERE — The Green Beans are basically coated with Egg and seasoned Bread Crumbs, then baked in the oven. I used Panko Bread Crumbs instead and seasoned them with Smoked Paprika and Ground Chipotle, Salt and Pepper. 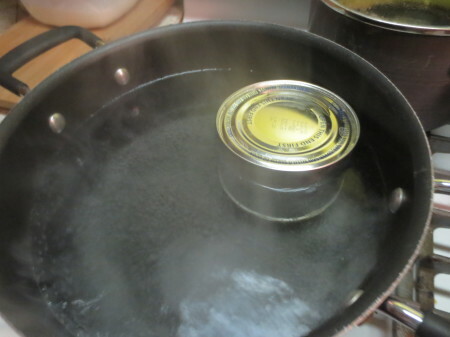 They were of interest to try, but I prefer Green Beans simply made with Butter, Lemon Zest and S & P, or with Bacon. Apologies for the poor copycat photos — Love to experiment with almost everything. No Sour Grapes Over Warm Grapes: Just A Copycat Fix-er Up-er. 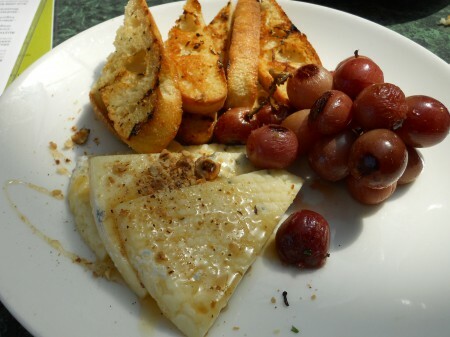 We like Plums Café, but weren’t thrilled with their Oregonzola and Roasted Muscat Grapes (below). We like the concept of it, but the warm Grapes just didn’t taste right to us and the Oregonzola (Gorgonzola from Oregon, where the café owners are from) was a bit too hard. Since we left cheerless about it, I made a copycat to get its potential out of our system. 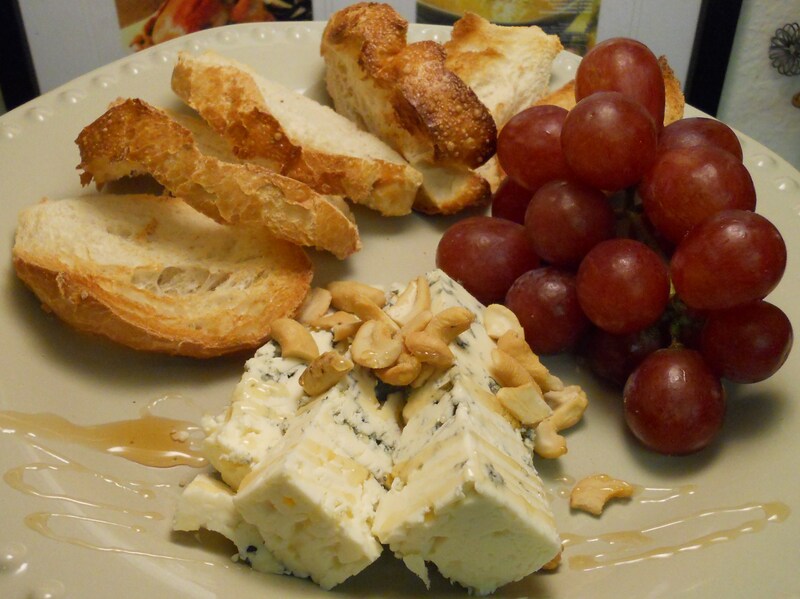 For our copycat (top), I used Cal-Gorgonzola, if you will, with chilled Grapes and Cashews instead of Hazelnuts. Both are drizzled with Wild Flower Honey. Plum’s Bread was better than ours, but we preferred this copycat/version and have much respect for its ($11) source. Pardon The Cupcake That Landed On Top Of Our Tidbits. In some views there’s a (temporary) gap of space at the top of this blog. We know and want it fixed soon too. All else is well here otherwise, except the Wicked Witch of the East, though looks fairly simple to recreate with fondant and an upside-down Chocolate Cupcake. 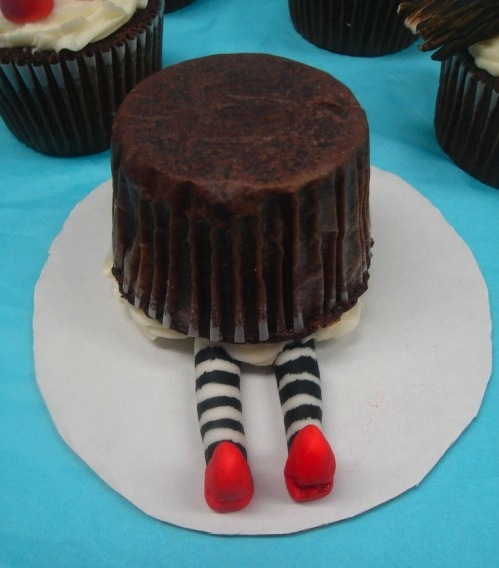 Please endure the calamity and look beyond the illustrative Cupcakes or make some. 04/13/12 Update: The display issue appears fixed. Let’s hope it doesn’t revert back (again). 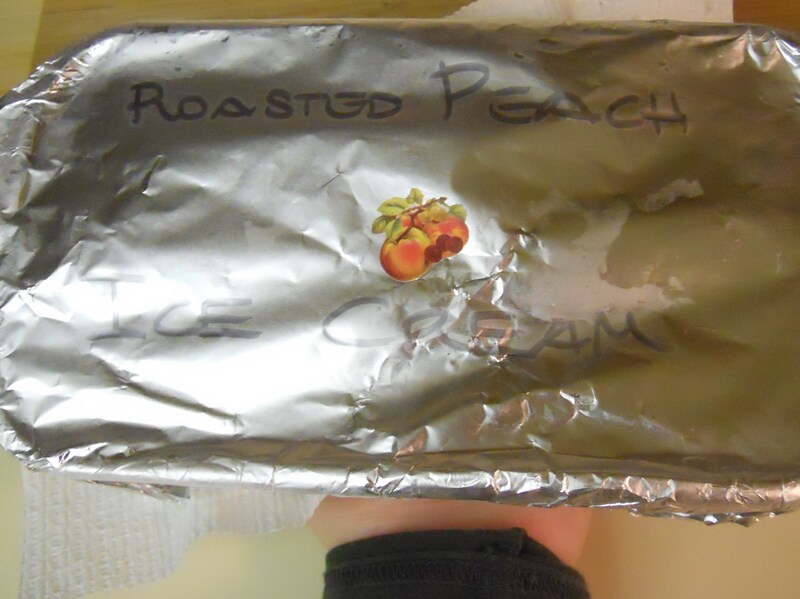 Roasted Peach Ice Cream: Will Never Not Roast ‘Em Now. 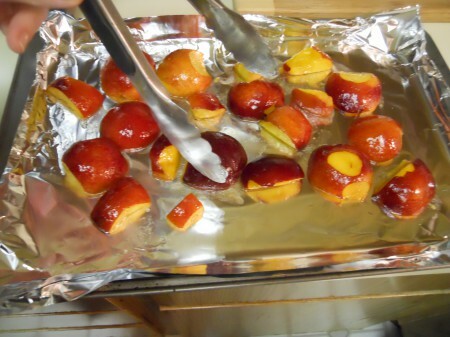 Searching for an adaptable Peach Ice Cream recipe, I came across Sticky Gooey Creamy Chewy’s Roasted Peach Ice Cream and it was over and on — I began roasting Peaches. I had 5 Peaches, 1% Milk, Cream, Sugar & Vanilla on hand and made the best recipe with all. 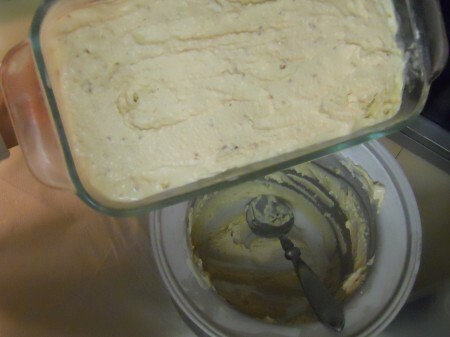 Inspired by the linked recipe, I got lucky with the ingredients and measurements used to make the pictured Roasted Peach Ice Cream, and will happily make the same over and over again. 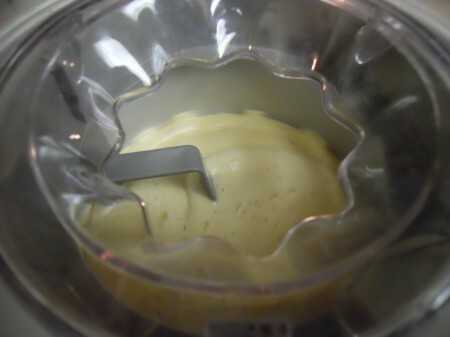 Always wanting to simplify a process, I merely blended the ingredients, and then transferred the mixture to an Ice Cream Maker to churn — And it couldn’t have turned out better. 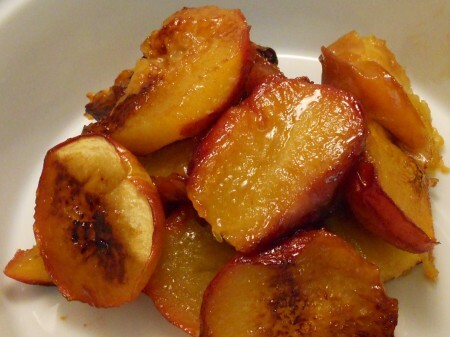 It’s crazy good — I’ll roast Peaches forever for this Ice Cream. A new favorite, Roasted Peach Ice Cream is documented below — Try it. 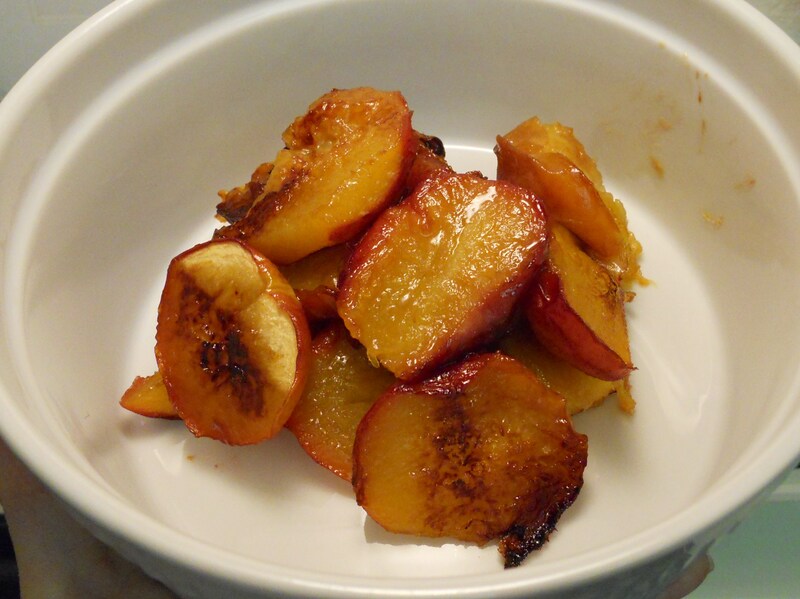 RECIPE: Halve, pit, and toss 5 – 6 Peaches with Brown Sugar (1 – 2 Tbsps.) and roast them cut side down in the oven at 400° for 25 – 30 minutes, and then set Roasted Peaches aside to cool. Add cooled Roasted Peaches (with skins) to a blender with 1/2 Cup of Cream, 2/3 Cup of Sugar and 1 Tsp. of Vanilla. Once well-blended, add 1 Cup of 1% Milk and blend a little longer to combine. Transfer mixture to an Ice Cream Maker and churn for 30 minutes. Viola. Emerald Of A Lemon-Lime Fruit Gem: Best Recipe (For All) In Stone. Our Best Recipe for Orange, Grapefruit, Lemon-Lime, and Lemon or Lime Fruit Gems is HERE. 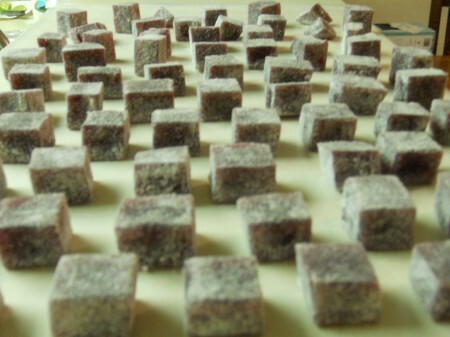 Like an Emerald, a discovery was made, then cut and polished for optimum consistency and flavor. The pictured were made with Lemon and Lime Juice and Zest. All flavors are superb. Homemade Fruit Gem Ingredients: 1 Cup of Corn Syrup, 1 Cup of Sugar, Zest of 1 (Orange, Grapefruit, Lemon and/or Lime), 3/4 Cup of Fresh Squeezed Juice (Orange, Grapefruit, Lemon and/or Lime), 7 Tbsps. 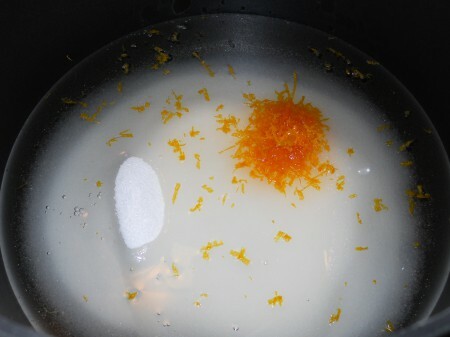 of Fruit Pectin, 1/4 Tsp. 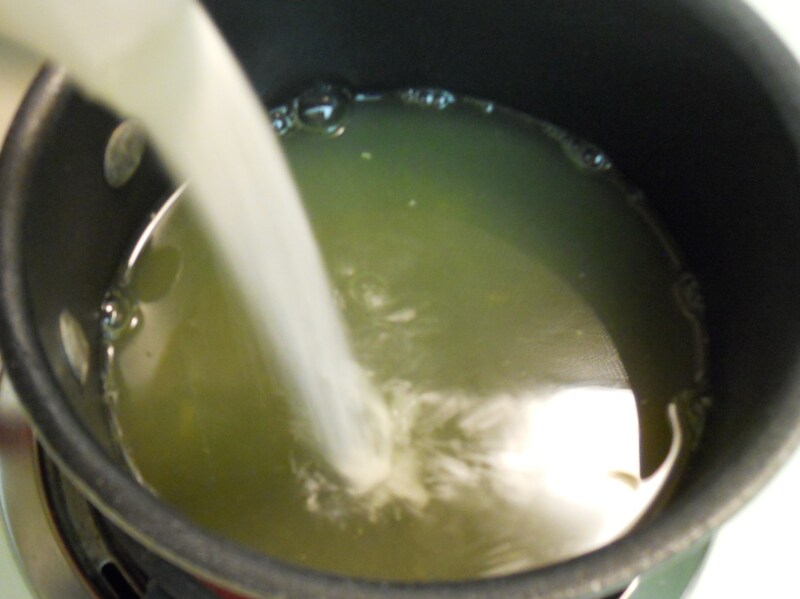 of Baking Soda, and Food Coloring (optional to improve color). Recipe was fine-tuned after earlier posting and best measurements are noted herein, and amended in this post, for best clarity and color, though the previous variation worked well too. 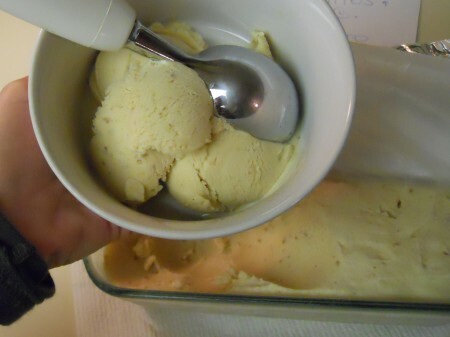 Step-by-Step instructions (and same recipe) are linked here. Irish eyes smiled this day — Should Lemon-Lime become the New March Madness? 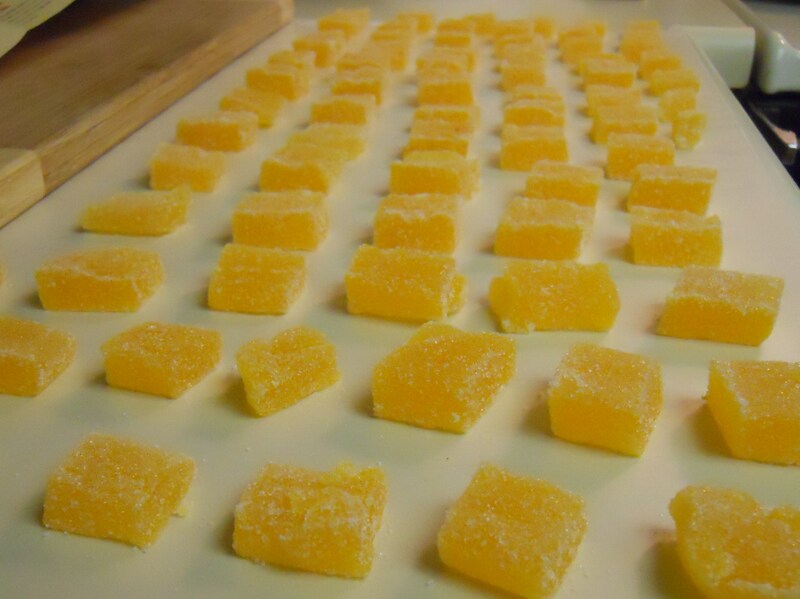 Eureka: Homemade Fruit Gems Aka Best Orange Slices Squared. I’m beyond thrilled to know it’s easy to create one of my favorite Candies, Fruit Gems, also known as Fruit Jellies aka Orange Slices, when flavored Orange, like the first batch I made. 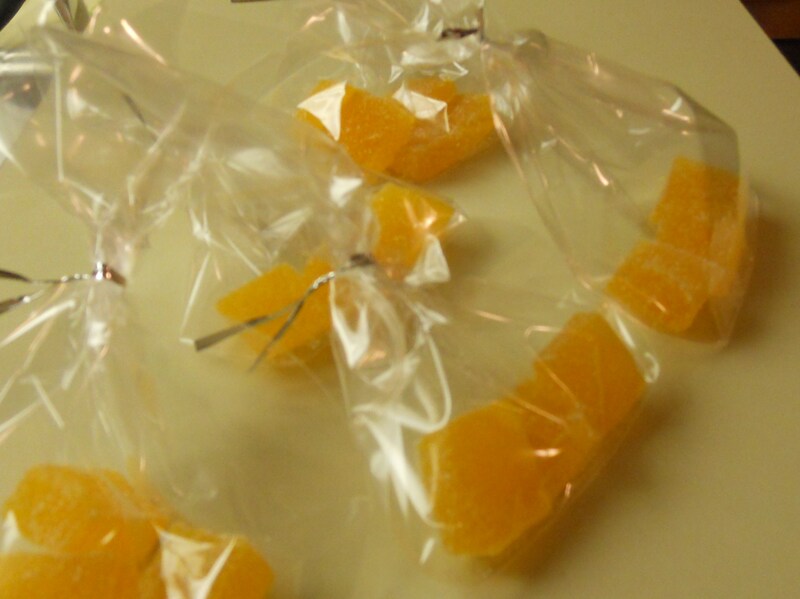 I found a Raspberry Jelly Candy Recipe that I adapted to make the pictured Orange Gems. 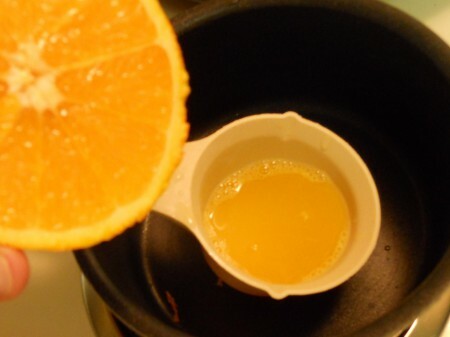 Instead of Raspberry Extract and Water, used in the linked recipe, I substituted Orange Zest and Orange Juice — Technically the Juice of 1 Orange plus enough Water to equal 3/4 Cup. Orange Gem RECIPE In Short: Boil 1 Cup of Corn Syrup with 1 Cup of Sugar and Zest of 1 Orange, and in a separate sauce pan boil 3/4 Cup of fresh Orange Juice with 7 Tbsps. 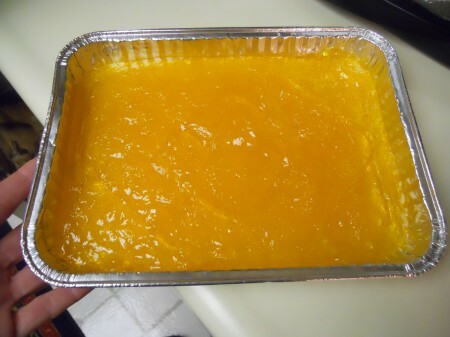 of Fruit Pectin and 1/4 Tsp. 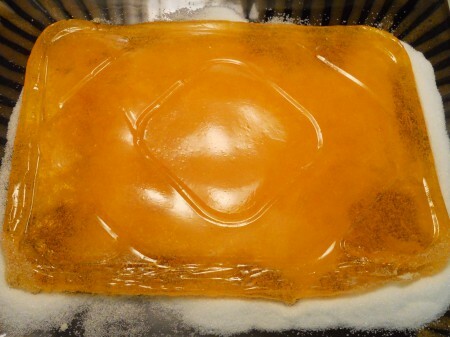 of Baking Soda — Marry the two combinations, once boiled, and stir for a minute longer, then pour mixture into easily unmold-able pan (as shown). 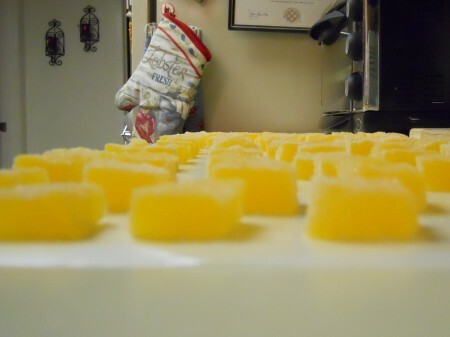 Bendable, disposable aluminum pans work well for unmolding Candy. 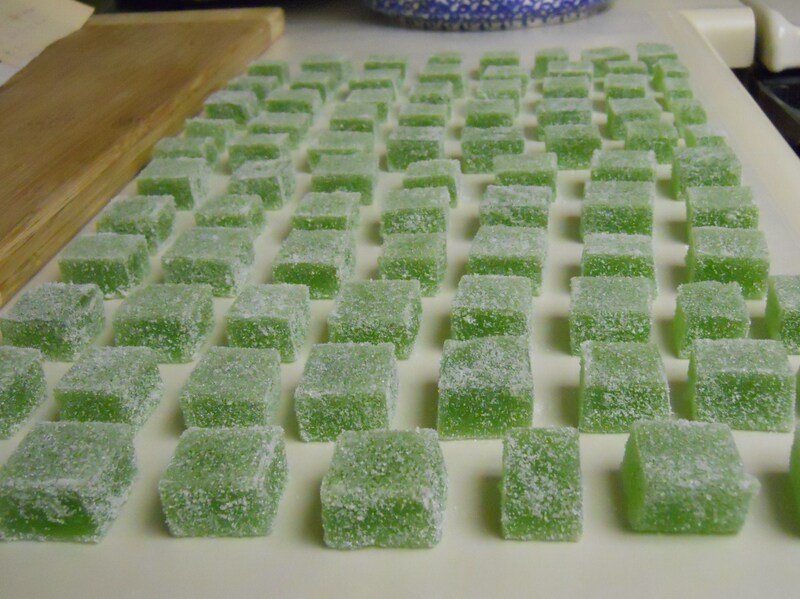 Before dropping into Sugar, let Candy sit and set, loosely covered on the counter overnight. 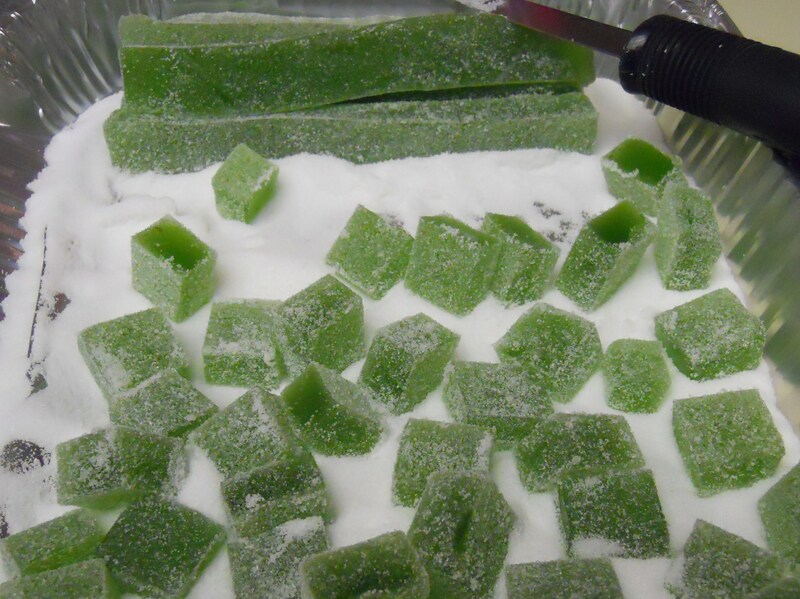 Cut into strips, then squared gems and coat all sides in Sugar — Voila, they’re awesome! They taste better than any I’ve purchased — If you love Fruit Gems, you have to make these. All raved about them too — I made a second batch with Pink Grapefruit (below). And a third batch with Blueberry Juice and Lemon Zest. Nibbles Of Tidbits Most Popular Recipes In Photographs. A few of our most popular recipes were recently noted in this post — Here they’re linked and featured in photographs starting with the Quick Tender Oven Baked Baby Back Ribs. 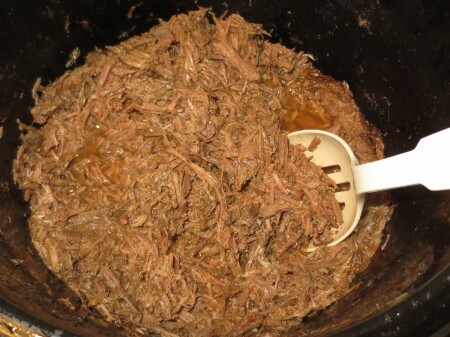 Have you tried Chipotle’s Barbacoa Beef? 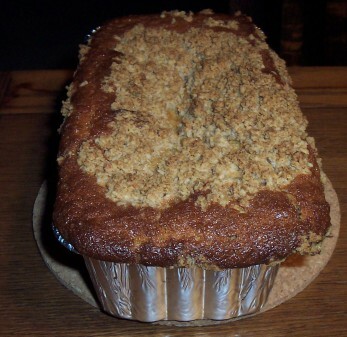 I love it and created a copycat recipe. 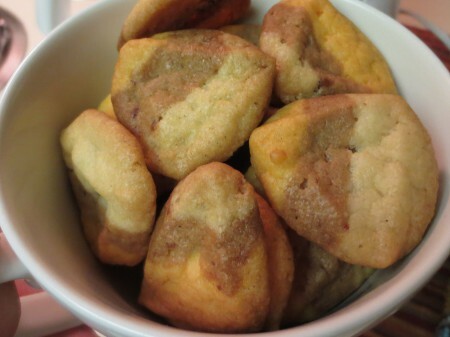 It may be the most viewed post on Nibbles of Tidbits — It’s a darn good recipe too. If you know the flavors, you’ll see. 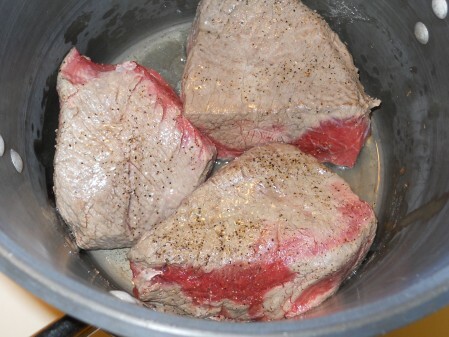 Our preparation starts by searing the Beef, then on to slow cooking to easily shred. Though the above photo doessn’t look that appetizing, it’s tasty as all get out topped with Goat Cheese. It’s another copycat recipe that works — Houston’s Braised Red Cabbage. 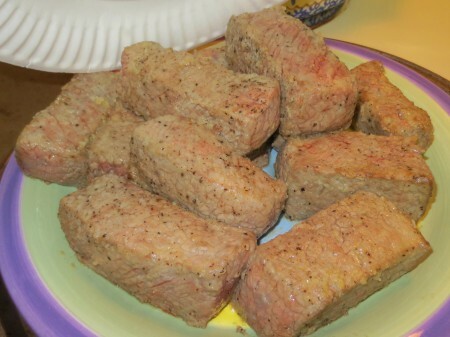 Have you ever gone through the hassle of preparing Amish Friendhship Bread? When I did, I thought it was quite burdensome, but after tasting the finished product, I’d do it over and over again. It’s one of the best Breads I’ve had — Complex, flavorful, moist and magical. Spotlight On The Most Searched Recipes: Spinach Artichoke Dip. 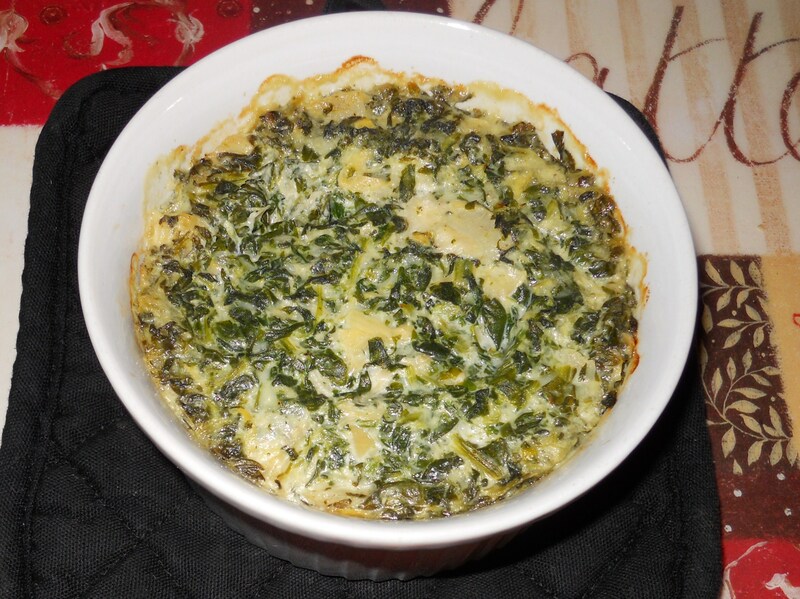 One of the most searched recipes on Nibbles of Tidbits is a copycat of Houston’s Chicago-Style Spinach Dip — To me (and confirmed by others), it captures the flavor and texture of Houston’s tasty Dip. 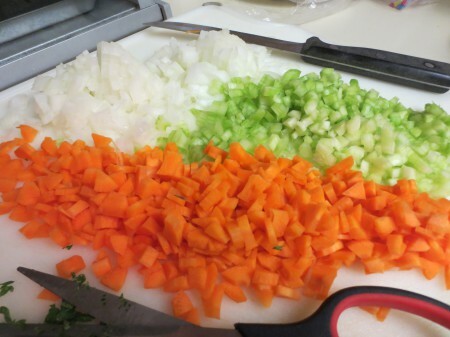 It’s a respectable recipe (linked above) that holds up well to this simplified variation. 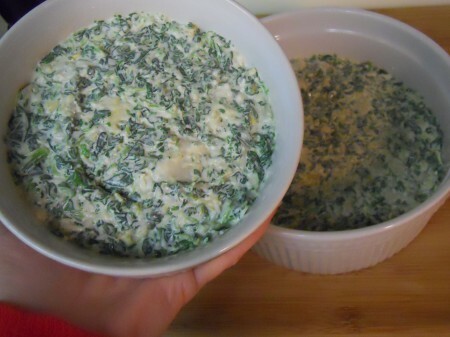 The pictured Spinach Artichoke Dip was prepared using the same recipe, without the Heavy Cream and alternatively increasing the Sour Cream from 1/2 to 3/4 Cup — This may be the better recipe (below), if too much Water is in the Spinach. 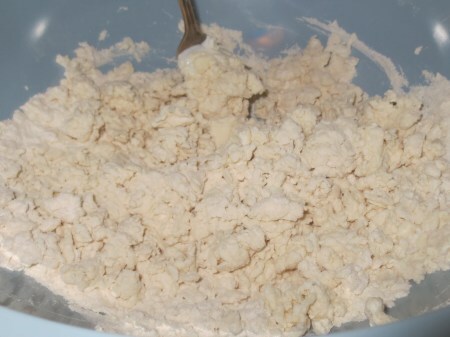 Mix and bake pictured ingredients. Bake in one to four dishes for an appetizer or individual side, depending on the crowd. 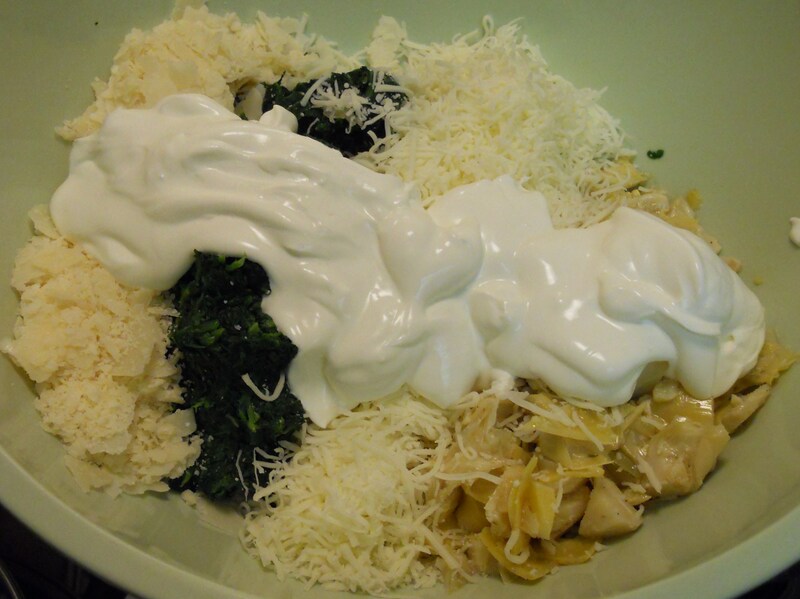 Mix all ingredients together well, then transfer mixture to an oven proof dish and bake at 350° for 30 – 35 minutes. Let cool slightly and serve with Tortilla Chips, Bread or Vegetables. 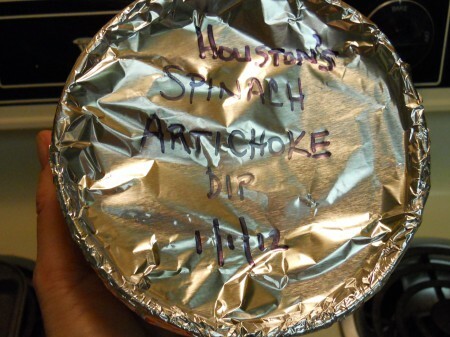 One dish to freeze for another time is good too. 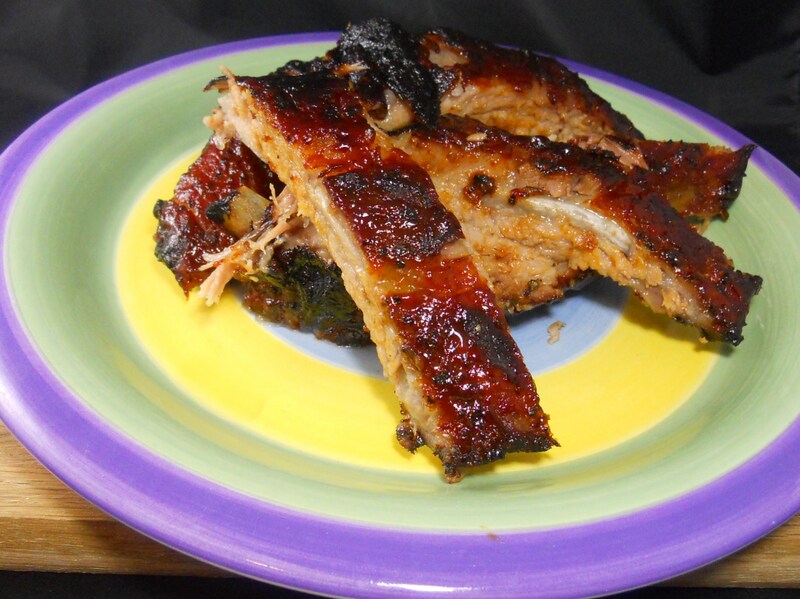 Note: The spotlight should also be cast on the following for being amongst the Top Five Most Searched Recipes in 2011: Houston’s Braised Red Cabbage with Goat Cheese, Chipotle Barbacoa Beef, Amish Friendship Bread and Oven Baked Ribs. Enjoy — Happy 2012! Use SEARCH BOX to quickly locate a restaurant, recipe or specific ingredients, FOOD related topics, events, contests, products and more. Nibbles of Tidbits attempts to be updated daily. 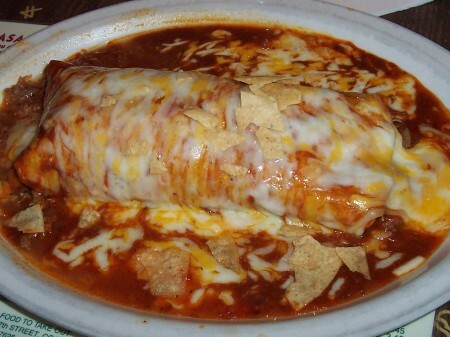 Please write to services@ineedtext.com to (potentially) have your Southern California Restaurant or FOOD related product pictured and reviewed here. Thanks for your interest. LIKE Nibbles of Tidbits on Facebook, though we don’t care if you do. Meal Kit Comparison: Which Is Best? The Best Time To Dine Out Is During Orange County Restaurant Week. Newport Beach Restaurant Week Starts Today. A Happy & Hardy 2019 To YOU From Nibbles Of Tidbits. Homemade Nicoise Salad (My Variation Made With Salmon). Which Company Delivers The BEST Meal Kit? Our Review Is Underway. Food & Fun With ‘My Fair Selfie’ At The Orange County Fair. Free Your Inner Farmer At The Orange County Fair. How Does Our Garden Grow? 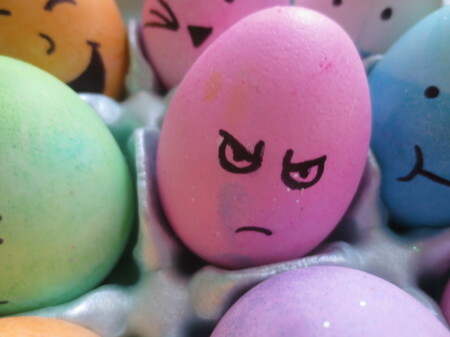 Temperamentally Well This Year. We Will Forever Stand For Our American Veterans: Thank You! Stay Tuned: Still Cooking & Nibbling On Tidbits Of Everything. 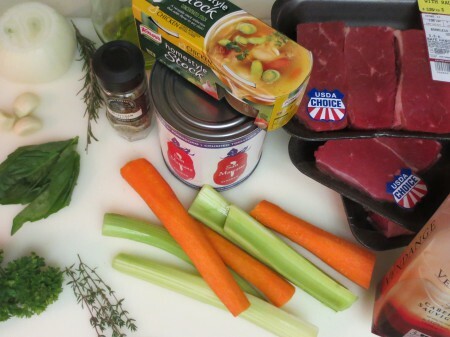 Home Chef: A Weekly Meal Delivery Kit Comparison. Veterans Eat Free On Veterans Day: Thanks To Paul Stanley & Others. Our Total Kitchen Remodel: Where Nibbles Of Tidbits Get Cooked. 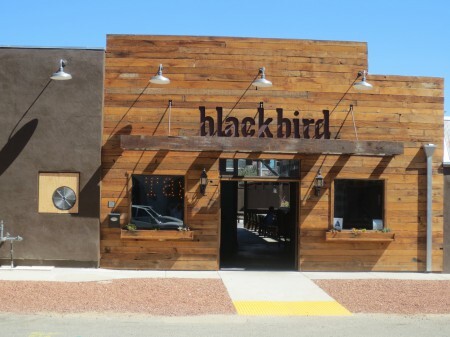 The Slidebar Rock-N-Roll Kitchen: Grubs’ Scratch Made Surprise. Earl Rosa on Which Company Delivers The BEST Meal Kit? Our Review Is Underway. 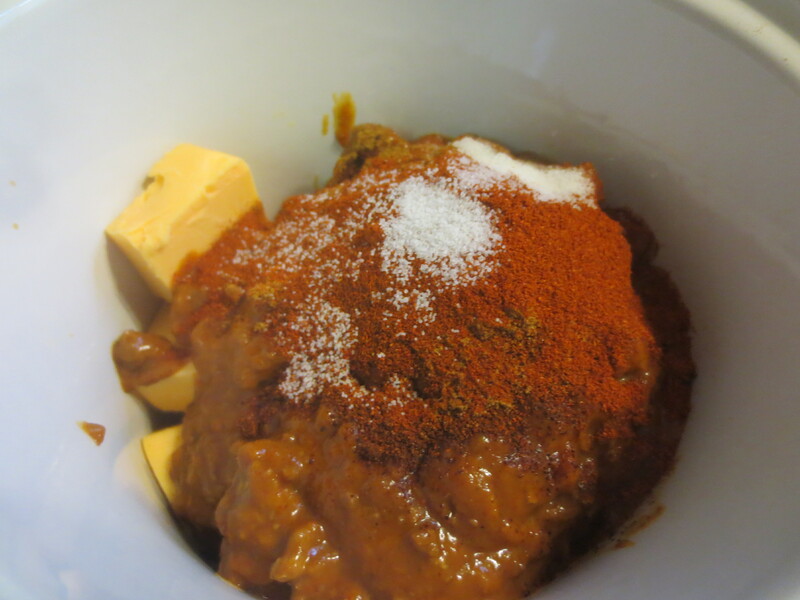 FoodBlog on Chipotle Mexican Grill’s Barbacoa Beef Recipe (Wannabe) Is A WINNER. Sarahi on Chipotle Mexican Grill’s Barbacoa Beef Recipe (Wannabe) Is A WINNER. 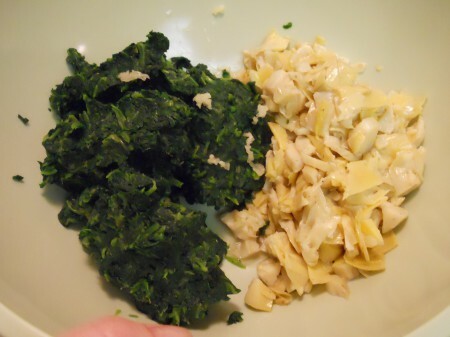 Nibbles of Tidbits, a Food BlogOh How Nibbles Of Tidbits' Garden Grows: It's A Better Year Here. 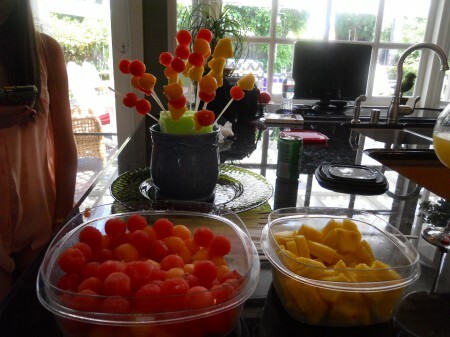 - Nibbles of Tidbits, a Food Blog on Tending To A Flourishing Garden: Appreciate Each And Every Growth. Nibbles of Tidbits, a Food BlogTending To A Flourishing Garden: Appreciate Each And Every Growth. - Nibbles of Tidbits, a Food Blog on Oh How Nibbles Of Tidbits’ Garden Grows: It’s A Better Year Here. Link To Women Who Blog. Categories & Archives are linked above and below -- If you don't find what you're looking for, send us an e-mail. We try to reply to all serious inquiries. Thanks for visiting.